The Forge offers a full service package of gunsmith, blacksmith, weapons craft and custom jewelry. Gun work is done by a master smith for all known firearms and custom work is also available including fabrication of rare or non-available parts. 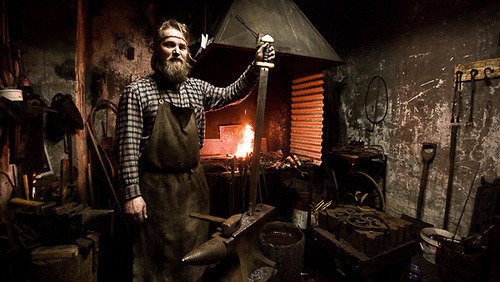 Weapons craft and blacksmith is journeyman class work with emphasis on quality not speed. Black smith works also include decorative works for work and home. Etaine NightBreed offers regular hand crafted jewelry and accepts custom orders as well. So stop by and see what we have to offer and visit a spell. The blacksmith is located in the back end of the shop at a safe distance from the main store. There most weapons and other items can be crafted by Eirie himself.
" Is anyone here? i saw the door was unlocked." " Is anyone here? i saw the door was unlocked." She walked up to the counter quickly and noticed a pistol and a shell on the counter. "How may I help sir?" * turns from perusing the stock inside the display cases, hearing the lady's voice. * " Yes ma'am I hope so, I was wantiong to get my pistol looked over and cleaned. The action has been stiffer than usual. And i could use another supply of .50 caliber ammo for the same pistol. If i am not mistaken you would be Etaine NightBreed? I am Kenneth Ripper, I know Eire from years ago and he is the only person I deal with for ammunition and repair work. * smiles gently and offers my hand* " A pleasure to meet you." Etaine looked at the gun and the shell that lay on the counter. She nodded and then smiled. "My mate can take care of that for you. He carries that ammo as well. IF he doesn't he can get it. We have just opened not everything is in stock yet. But. he can repair the gun good as new. I am Etaine NightBreed. Pleased to meet you Kenny Ripper." Etaine shakes his hand as she smiles softly. A pleasure to meet you as well." " That is good to hear *grins* I found that pistol on a run a group i was in made chasing down some folks who loved to torture kids and young mom's. It started ut as a black powder pistol converted to fire a brass cartridge. Breed has since reworked the whole thing so it can handle custom handloads. I still use an old fashioned black powder but the modern kinds surely do fire better than the old rough grained powder did." "The pistol shows his workmanship. I have a modified pistol as well. It's a beauty. But that sounds like an adventure. Did you stop those people?" Etaine listened closely to Kenny Ripper as he described the pistol a bit more. "Erik does a great job on guns. Recently he's taken to blacksmithing hand weapons as well." " Oh yes they were stopped in a permanent nature. He's begun blacksmithing as well now? Interesting that is, he'd be good at ithe has the patience for it, i prefer working with wood hence my carving skills and i also make custom bows and arrows for them. Do you do smith work as well?" A cloaked figure looks at the sign as it enters the store and looks around at the swords and other weapons that are in the store before it seems to wait for whoever owns the store. The cloaked figure looks to be about six foot tall and the weight and gender is unknowable unless the cloak hood falls off or the person underneath takes it off. The hood should show the face but a black mist holds the face is darkness that the light can't go past.
" Welcome to The Forge, is good to see you once again.. I am Eirie NightBreed part owner, my wife Etaine is the other half *smiles*. How can i help you this eve, you looking for a blade of some sort, a fire arm, or a blunt weapon for use? If you are looking for some jewelry we can help you with that as well as Etaine does design work and makes her own pieces." The cloaked figure pulls out two swords and a sniper rifle and a broken locket that seems to have been hit by something. The cloaked figure sets these on a free placeand pulls out a piece of paper that has magic about it. The paper suddenly says, "I would like something done to strengthen my swords, some way of making my sniper rfile here more accurate, and my keepsake here fixed. I would like them done as soon as possiple before I have to go out of town." The cloaked figure stays still and might be looking at Etaine or Eirie but it is hard to tell with the dark mist hanging in the hood which blocks all view of the face beneath. The swords i can add a rune to each to strengthen the blades making them nearly unbreakable, the rifle i'll look over and it could be something as simple as reboring the barrel or the scope is out of alignment inside. I can have them 3 done in a couple of days if that is okay with your travel planning. * looks at Etaine* The locket appears to have been hit by something can you fix it?"